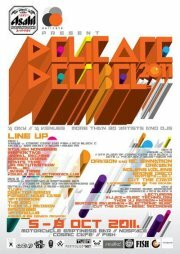 “This is the third year of the delicate decibel music festival. There will be many artist who specialise in numerous styles and genres of artists !! We will bring you well known DJs and artists who will entertain you with exciting presentations throughout 4 music filled days. this years programme includes VJ Electrobacillus ,VJ Deyan Raykov will also make an appearence with his specialist materials and live visuals. The third night will have LIVESEQUENCES from The Makok.